Now, we have protests in the streets about the election. “Not my president,” they shout. But what do they think they will accomplish? Part of it is just a reaction to Donald Trump’s incitement of riots if he were to lose. Trump even continued his victim mentality, claiming that the riots were planned. Then, realizing that it was past time to complain about the system that put him in power, Trump tried to sound “presidential” and “inclusive,” actually praising the protesters. “Love the fact that the small groups of protesters last night have passion for our great country. We will all come together and be proud!” Trump tweeted early on Friday. The protests, like the earlier “Occupy Wall Street” protests, are full of sound and fury, but signify—nothing. Both will have been forgotten in a few months. Perhaps, even, by the time Trump takes office. Even so, there are a lot of people who are upset. From New York to Los Angeles, demonstrators have marched in various American cities for four nights since Trump’s unexpected victory Tuesday capped an acrimonious campaign. In Cincinnati, anti-Trump demonstrators were joined by hundreds of people protesting a hung jury in the murder trial of a former University of Cincinnati police officer who fatally shot a black motorist during a July 2015 traffic stop. In Los Angeles’ MacArthur Park, the site of immigrant rights protests over the years, demonstrators took turns Saturday swatting a stick at a piñata resembling Trump. . . In New York, angry crowds — some carrying signs with messages such as “Not my president” — marched to the President-elect’s doorstep, Trump Tower, where he lives and works. For part of the march up Fifth Avenue, they chanted, “Donald Trump go away. Racist — sexist — anti-gay.” . . . In Portland, a man was injured in a shooting early Saturday on the Morrison Bridge during a protest march. . .In Chicago, police told CNN they are investigating an incident this week in which a group of people reportedly beat a man while yelling that he voted for Trump. . . In Iowa City, Iowa, about 75 protesters shut down I-80 briefly, police Sgt. Chris Akers said. . .In Dallas, protesters dragged and kicked a Trump piñata through the streets. . . In Atlanta, about 500 people marched downtown. 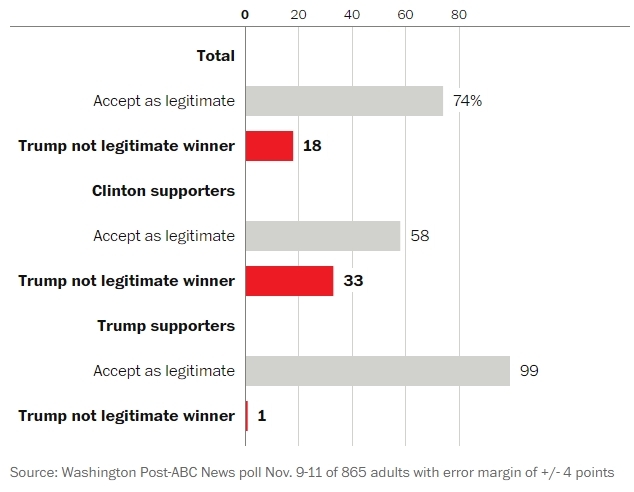 But while Trump supporters were more reluctant about accepting results before Tuesday — 22 percent said they were not prepared to do so — an even larger share of Clinton supporters now say they do not view Trump’s election as legitimate. It should have been predictable that the election would end in violence. This was the first time in our history that a candidate claimed the election was rigged before it happened. When you sow the seeds of doubt, you shouldn’t be surprised by the harvest. Of course, some of the anger comes from the fact that Hillary actually won the popular vote. The LA Times (whose poll consistently said Trump would win) reports that there are yet four million uncounted votes in California. Considering that Hillary took the state in a landslide, it’s safe to assume that most of those votes will go to her column. Elections officials across California have more than 4 million ballots that have yet to be checked or counted, a number that’s almost half as large as all the ballots tallied so far from Tuesday’s election. The official total — 4,362,087 ballots — will undoubtedly change and possibly even grow over the next few days. Three counties, including vote-rich San Diego County, did not submit an estimate of unprocessed ballots for Thursday night’s statewide report. In addition, California law says that any ballot postmarked by election day can still be counted if it arrives as many as three business days late. State officials have extended this year’s deadline to Monday, because that third day, Nov. 11, is a federal holiday. The fact of the matter is that Trump didn’t actually “win” the election, Hillary “lost” it. 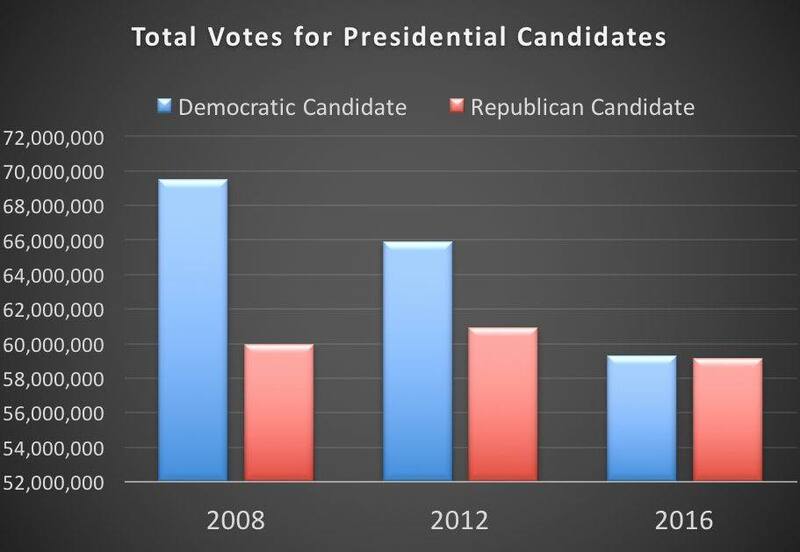 Look at this chart, showing voting totals from the last three elections. Trump’s portion was lower than for McCain and Romney, but Hillary’s was WAY lower. However, the chart is the unofficial totals. Cook Political Report says Hillary’s total could go much higher. “We probably have about 7 million votes left to count,” said David Wasserman, an editor at Cook Political Report who is tracking turnout. “A majority of them are on the coasts, in New York, California, and Washington. She should be able to win those votes, probably 2-1.” By mid-December, when the Electoral College officially casts its ballots, Wasserman estimates that Clinton could be ahead by 2 percentage points in the popular vote. . . But let’s be clear: While these uncounted votes may grow Clinton’s popular lead, they absolutely will not change the course of the election. That math is settled; Trump holds an insurmountable lead in swing states, which turned his popular defeat into a sizable electoral victory. If Hillary wins the popular vote by more than five million votes, it will spur those who say that our voting system should be changed. We have had that discussion in our pages. The winner take all ballot limits our choices as voters and the competition candidates must face. Trump won Pennsylvania by just 68,236 votes; Wisconsin by 27,257; and Michigan by only 11,837. That’s less than 100,000 votes to get 46 electoral votes. In other words, about 7/100 of 1% of the vote brought Trump 17% of the electoral votes he needed. But he was also talking about the fact that in a close election, an insignificant candidate, such as Ralph Nader, could throw an election to a candidate who is diametrically opposed to the insignificant candidate’s beliefs. This happened in Florida in 2000. The spoiler scenario it creates allows plurality winners instead of majority winners. Likewise, this year, the far-left candidate, Jill Stein, probably handed the election to the conservative candidate again. Vote totals were so close that if Stein’s votes went to Hillary, Hillary would have won a few more states—and the election. That’s why Republicans have won the popular vote only once out of the seven most recent elections—yet won the Oval office three times. Shouldn’t the purpose of an election be to establish the will of the majority, not allow a plurality to thwart the will of the majority? I’m not so sure. Yes, it would be logical to think that an actual majority winner should gain more respect than a plurality winner. But who’s so logical? It would be easy to argue that the voting age population is only a fraction of all Americans—and that a huge number of prospective voters just don’t bother. The real “silent majority” remain silent—at home, watching the ball game or reality TV. That’s without factoring in voter suppression, intimidation, or outright fraud. The era of universal respect for the office of president is decades behind us. Moreover, the idea of wanting a majority win goes against a much greater desire among the people to have strong third parties, which can bring new ideas, and force the major candidates to face uncomfortable facts. Regardless, the bottom line is that to change the system, you’d have to have the power to do so. In 2017 America, the GOP will control the Presidency, the Senate, the House, the Supreme Court, all but 17 governorships (highest number since 1922), most state legislatures, and face it, the right to gerrymander for decades to come. In short, the GOP has nearly absolute power—absolutely, and they’re not about to monkey with an electoral system that is working so well for them. Do you have an opinion you’d like to express? Should probably start there. When you have some idea what you’d like to cover, we can give you appropriate links. You could begin by reading some articles here, and see if anything strikes you as a good topic. You could talk about how the real people left out in our country live in Alaska with their 3 electoral votes.